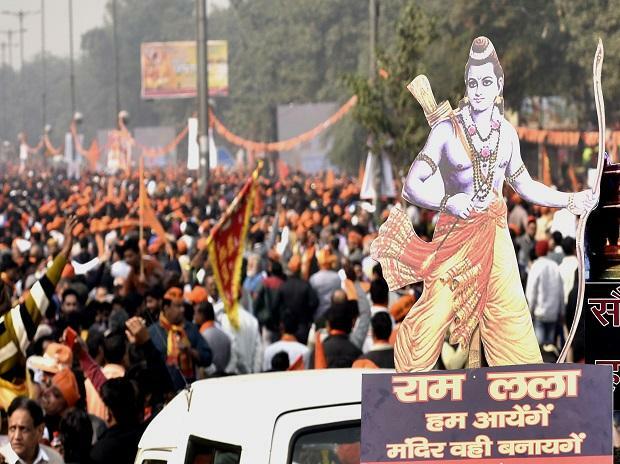 With Lok Sabha elections some months away and Sangh Parivar outfits demanding an early construction of a Ram temple in Ayodhya, the Narendra Modi government on Tuesday asked the Supreme Court (SC) to allow it to return the "non-disputed" surplus land acquired around the disputed structure to a Hindu trust and other original owners. The move, if the SC were to agree, could pave the way for some construction, if only on the peripheries, of the disputed site by Vishva Hindu Parishad (VHP) and other Sangh Parivar affiliates in the run-up to the polls. In its 33-page application, the Centre sought modification of the SC's 2003 order to permit it to return 67.390 acres of "non-disputed" surplus/superfluous land around the disputed Ram Janmabhoomi-Babri Masjid structure in Ayodhya to the original owners. However, the court had held that unless the dispute is resolved, the status quo has to be maintained over surplus land. The Centre’s application claimed that only 0.313 acre of land was disputed. The 0.313-acre land, on which the disputed structure stood before it was razed by Hindutva activists on December 6, 1992, was within a compound measuring 2.77 acres. After the destruction of the Babri Masjid mosque that triggered Hindu-Muslim riots across the country leaving about 2,000 people dead, the then P V Narasimha Rao-led Congress government at the Centre acquired 67.703 acres, including the land measuring 2.77 acres, through legislation in 1993. The VHP welcomed the government move. Its international working president Alok Kumar said the VHP hoped the SC "shall expeditiously decide on the application" the Centre has filed. The BJP defended the move. It said the Centre is not touching the disputed area. Party leaders said any return of the undisputed land could pave the way for construction of a Ram temple at the disputed site. The Modi government is under pressure from the Rashtriya Swayamsevak Sangh (RSS) and other affiliates to explore avenues for early construction of a Ram temple. "Today, the government has taken a very important in-principle decision to return the excess land, acquired in 1994 to the original landowners. One of the landowners of 42 acres out of 67 acres land is Ram Janmabhoomi Nyas. The government wants to return the land to its original owners and they want to build the Ram temple there," BJP leader and union minister Prakasha Javadekar said. "We are confident that the government will get permission from the court at the earliest," he said. All India Majilis-e-Ittehadul Muslimeen (AIMIM) leader and Lok Sabha member Asaduddin Owaisi tweeted: "This insidious attempt by the Centre should not be ignored. They're trying everything in their capacity to prevent a fair and independent adjudication of the Babri Masjid dispute." He said that in 2003 the SC held that unless the dispute was resolved, status quo had to be maintained over surplus land. Owaisi said the government was aware of this but was threatening the judicial process to save the BJP from their rapidly diminishing political fortunes. The Congress did not comment on the development. The Communist Party of India (Marxist) said the move was aimed at appeasing the Sangh Parivar ahead of the polls. In a statement, the party's politburo said it was a "devious" effort on the part of the government to "pre-empt" the decision of the SC. The move by the Centre came even as the apex court is set to hear 14 appeals against the 2010 Allahabad High Court judgement, delivered in four civil suits, that the 2.77-acre land be partitioned equally among three parties -- the Sunni Waqf Board, the Nirmohi Akhara and Ram Lalla.